Ahh summer...warm days, sunshine, and no school so the kid rolls out of bed at 6am because why not?? Yeah, pass the coffee. Make it a triple. 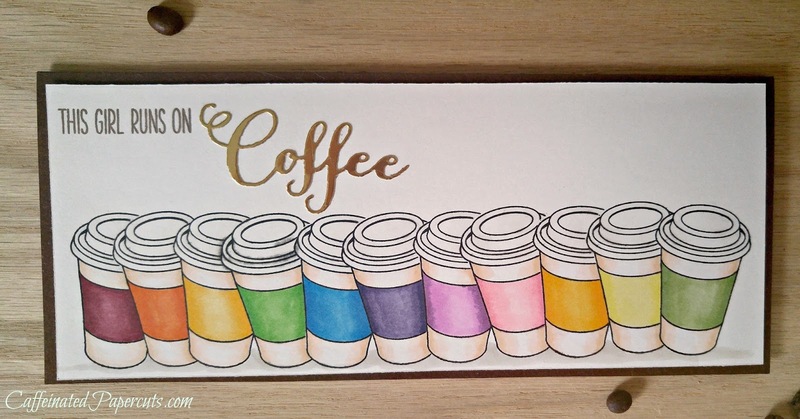 Thus was the thought of my massive coffee cup line up, pretty sure this is how many cups I'm going to need a day now that the munchkin is dragging me out of bed instead of me dragging him out of bed. And hey, the Summer Coffee Lovers Blog Hop is kicking off as well! Perfect timing. 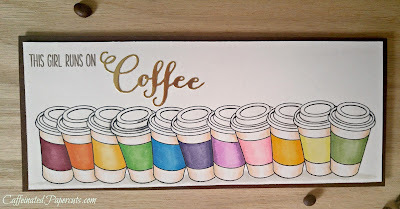 I wanted to give a #10 card size a try, and a rainbow of coffee cups seemed like just the thing! I simply made up a couple of quick masks with some Post-its and stamped away. I know, it looks terrifying, but I think I had it stamped in 5 minutes. Then I was able to color away...which took more like 3 nights. #momlife, ya know? The cup is from the Simon Says Stamp Coffee and Tea set which I adore, and the sentiment is from The Ton's Hug in a Mug set, which I also adore. Really, if it involves coffee, I likely adore it. The die is from Verve and cut out of gold foil. All right, I'm off to refill my coffee cup. 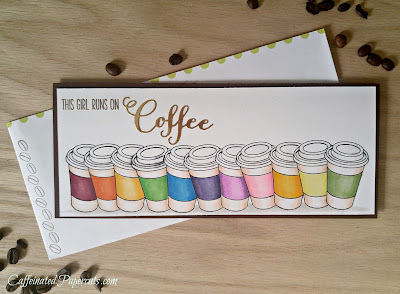 I have links to the products I used below and will hopefully be back with more coffee cards during the hop. Thanks for stopping by, and Happy Caffeinated Crafting! Some links are affiliate links, which simply means I receive a small commission if you purchase something using them at no extra cost to you. That commission keeps the blog running and funds all of the giveaways, so thank you for using them!